Hard times are, well, hard. Watching someone live through a difficult circumstance, whether it be a death in the family, a dismal diagnosis, a job loss, or a myriad of other possibilities, is often heartbreaking and at times awkward. Awkward in that we so badly want to help in some way or say the right words that will offer comfort, but we discover that we have no idea what to say or how to say it, and we certainly don’t want to say the wrong thing and have it bring more hurt into an already delicate situation. I’ve had a little experience with difficult times in the past as have many of you, and there are some loose do’s and don’ts that I’m going to share in this post. Anyone who is the midst of a treacherous journey this side of eternity will attest that there certainly isn’t a score board for appropriateness, but there are ways of saying or doing something that are more effective and life giving than other ways. This post is meant to help – not hurt or condemn so take it for what it’s worth. First, you don’t have to say anything – really. You can even say, “I have no idea what to say” or “There are no words.” We’re good with that. There’s no shame in either of these heartfelt expressions. Honestly, we have no idea what to say either. It’s bad. We all know that. We often feel like we’re living completely naked in front of the world through our deep pain – which is all too obvious. It is what it is. We’re grappling with the words just like you are. Hugs are good. Real, tight, sincere, break your neck type of hugs. “I’ll be praying for you.” I’ve struggled with this one – not always but sometimes. In 2010, in the midst of complete chaos with a husband diagnosed with brain cancer and four young children, and I was just trying to not drown or completely lose my mind or end up in the looney bin, and I’d hear “I’ll be praying for you,” randomly thrown into the midst of the madness, almost flippantly. These words often felt like they were said to relieve an awkwardness on behalf of the speaker who had no idea what to say. Maybe these people sincerely went home and prayed, but it often seemed forced, guilt induced, and more for the benefit of the one speaking than for my benefit. However, if these words were attached to a tangible way of helping – they spoke Jesus much clearer (and louder) into my situation. Someone called me once, a person I had never had a conversation with before, out of the blue, to tell me that God told them to call and pray with me. My husband was in hospice, I had an eleven month old baby, a three year old, a handicapped five year old and a seven year old. My life was in complete shambles, and this person kept me on the phone praying for over an hour – through the baby’s cries, Mabel’s babbling, Luke’s screams, and my hisses for them all to settle down. I have no idea what was said except that it was loud, sounded spirit filled, and totally for his or her benefit – not mine. Moral of the story, there is a time and a place. Really evaluate the situation, and if your deeds would speak a louder Jesus than a long, elaborate prayer, go with deeds or pray in private. Those prayers are just as effective. Along those same lines, some of us are not necessarily comfortable with people running up to us in Walmart, boldly laying hands on top of our heads, and loudly praying for the whole store to witness. I would caution not to ever do this, and instead, realize that most people will find this situation highly uncomfortable. Not to mention, if these people are shopping at all during a difficult season of life, it’s probably a treat, and undoubtedly their time is limited before they need to return to their current reality. “All things happen for a reason”, or “God doesn’t give us more than we can bear.” Not appropriate to say in the midst of a difficult situation. We are told that in this world we will have trouble – not only told that, but it’s a promise to believers. We do not live for this world, but we are called to obedience in whatever he may ask of us, we are to obediently walk through it in faithfulness, and God may give us more than we think we can bear, but we are promised that he will bear it with us. Cards with words are nice. Cards with words and money are helpful. I realize not everyone can give but families are strapped during difficult times – especially when the primary breadwinner is involved. I still have every card given to me during Jason’s illness and my pregnancy with Luke. In those chaotic moments, the words meant very little, but now, as I go back and reread them, they are precious memories of how much we were cared for and loved during those years of hardship. “How can I help you?” You might get an answer or you might get “We don’t need anything, but thank you.” This is a lie. Press the issue a bit and offer tangible suggestions. I would usually start with the “We don’t need help….” then as suggestions were thrown out, I would jump on one or two of them. We ate TONS of casseroles. Initially the casseroles were great, and then we were on month 7, 8, 9, and we got to the point where tatter tot casserole lost its appeal pretty quickly. One specific meal has always stood out in my mind. I couldn’t even tell you who brought it but is was chicken fajitas with all the trimmings. She probably had 10 containers, beautifully filled with homemade salsa, sour cream, chopped tomatoes, lettuce, cheese, warm tortillas, and chicken. I’m sure it was a ton of work, but it was so appreciated! Here are some other unique ways that we were helped during out time of need. Gift certificate to order Schwans meals. A neighborhood church came over to do a yard clean up/fix my house/problems day. A group of ladies cleaned my house every week and bought me a new vacuum cleaner. Another group of ladies picked up my laundry on a weekly basis. People who were noticeably nervous about Lucas would take him for a complete day to the park, the zoo, wherever – just to give me a break. A church congregation bought my kids Christmas one year, the tree was overflowing with gifts for four children who had just lost their dad. My aunt purchased stepping stone kits for each of the kids so that they could make handprints with their dad before he passed away. A dear friend sat with Jason for hours while he dictated letters for me and the kids to receive after his passing. Numerous people brought Jason to and from work and also to his doctor’s appointments. A church stopped by with a van load of groceries. Someone offered to take Caleb clothes shopping for the new school year. Someone bought all of my children new shoes. A woman came over and volunteered her time to give us all haircuts. A woman weeded and picked the produce out of my garden. This same woman preserved the produce from the garden so that it wouldn’t go to waste. Another person bought me a massage. A friend brought over a bottle of wine and offered to just sit with me, no strings attached. A friend’s dad built a gate to our family room so that Lucas would be confined and I would be able to get some things done around the house without constantly monitoring him. Our neighborhood built a fence around my yard so that my kids would be kept safe from oncoming traffic and again, for my peace of mind. I had wonderful angels surrounding and lifting me up during a very difficult time, and I’m sure there were a million other ways people found to help that I’m not remembering. I hope this list doesn’t condemn but is instead helpful. Whatever you do, do something is the best advice I can offer. Sunlight Burning at Midnight – a Celebration of a Special Needs Child. It’s Lukie’s 12th birthday – be still my soul. 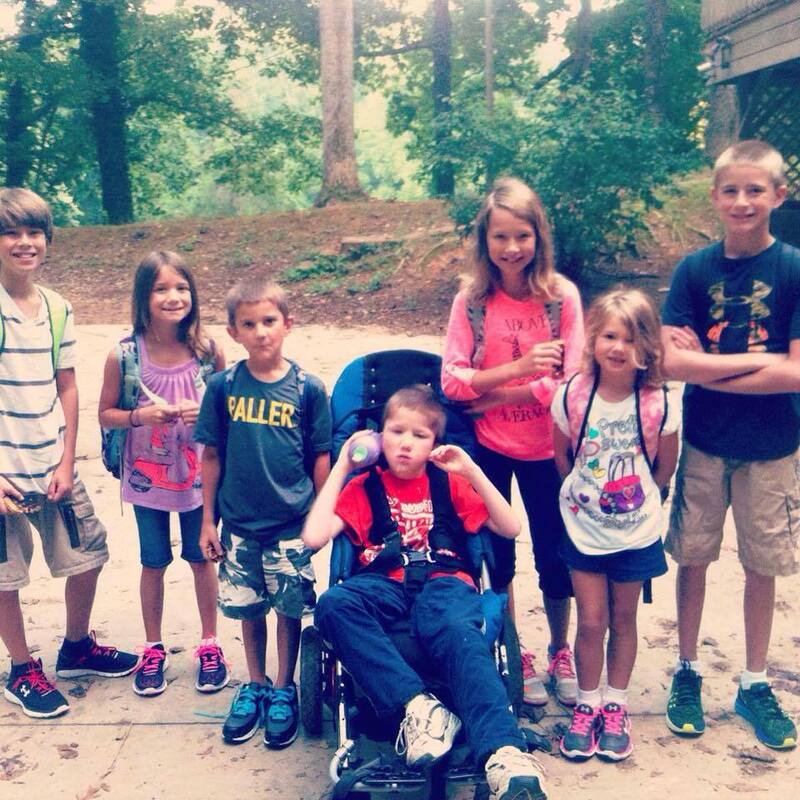 My miracle boy is a pre-teen – a pre-teen! From being told he’d never see the light of day to almost a teenager. Where have the years gone? There are so many emotions that flood my heart as I think on this day, this 12th year of his life, and the significance that it brings in terms of my own life and God’s faithfulness throughout many difficult times. And choking back tears through a fake brave smile as he was immediately whisked away to neo – natal care, Jason and I nervously looking on, unable to do anything for our newborn son in those moments. I think about the struggles we had while raising him, the fears, the sleepless nights, the angst of his lukisms, and the accomplishments that arrived much slower for him than for other children but monumental they were when they finally did make their arrival. I think about the future for Luke – the next 12 years – and some of those same fears begin to enter my heart. Will he be ok? Who will take care of him? What does continued growth (and puberty!) look like for him? God, can we handle this? Can Ryan and I do this with him? Really God, do you still have him and me and my family in the palm of your hand or have you moved on to some other family who needs your care more than we do these days? And so I lift my head. I look to the birds and the bees and the beautiful butterflies fluttering around my yard – not a care in the world. So much more faith than mine it seems. I remember – days of past, hard times, times I thought I would crumble against the weight of the world, crumble against the strain of what I was called to walk through, but I didn’t. He was faithful. He will continue to be faithful in whatever comes my way this side of Heaven. Today, Luke’s day, I choose to focus on the miracle of him and the impact his life has had on mine and on thousands of others, the impact his story, our story, will have on those who need hope, those walking through dark nights, those who need something miraculous like sunlight burning at midnight. I choose to focus on the honor that was bestowed upon my humble life which allowed me the privilege of walking through hardships in order to one day breathe hope, through my words, through my story, into another’s dark night. I choose to push my instinctual fears aside and focus on life, his life, the beauty of Lucas and all that he has been and ever will be. And so to honor Luke’s birthday, it seems only appropriate to release the trailer for my book, my baby, twelve years in the making – Sunlight Burning at Midnight, and along with the trailer release, I am offering a pre-order special because, of course, IT’S LUKE’S BIRTHDAY! The official launch date for the book will be in November, but for every pre-order I receive before this date, I am offering a personalized, autographed copy. As you can see, (hopefully) there is a nice, little box beside this blog post with fail proof instructions. Each book order ($13.99 +S/H) will be placed through pay pal and mailed as soon as hard copies are available (which will be before the official launch – the latest I’ve heard is the first week of October). So, not only do you get a personalized, autographed copy (believe me, the personalization factor will be a rarity in the future with my life), but you will also be one of the first human beings with a book in hand. As always, thank you to all – my publisher, my friends, my family, my husband, my kids, THANK YOU, thank you, thank you, thank you from the bottom of my heart for bearing with me, for lifting my head, and my heart, and my weary body years ago, for believing in this story and the message it conveys, and for supporting me through it all. To God be the Glory! Posted in My StoryTagged celebrating special needs children, faith, life, My Story, special needs children, the miracle of special needs children.5 Comments on Sunlight Burning at Midnight – a Celebration of a Special Needs Child. Recently I asked a few of my kids if they would answer some questions about blended families. They agreed. The four questioned were Caleb and Tate (13) Mya (11) and Mabel (9). My takeaways from the sessions were – Wow! They seem okay! As of now I don’t see extensive therapy in their foreseeable futures! Thank you Jesus! Given, they are youngerish, but at this point in their tender, little, lives, I think they are truly doing well. I would strongly encourage other families (blended or not) to question your kids and make it fun and non-threatening. The answers might lighten your heart and encourage your soul. Caleb – two families that come together to form one whole family. Tate-A mix of two families to form one big one. Mya – Two families that come together. How do you feel about being in a blended family? Caleb – It’s sometimes it gets annoying but sometimes it can be really good. When you’re playing a big group activity it’s useful. But when you want to be alone it’s better to have a small family. Tate-It can be fun but at times some people can be quite annoying. Mya – It just feels normal. How do you feel about having brothers and sisters that aren’t biologically your siblings? Caleb – it’s kind of annoying. They don’t exactly think like I do always. Tate – I don’t know. Mya – It feels the same as having a normal family. What is the hardest part about having a blended family? Caleb –Everyone always takes sides with things. Half the kids want one thing and the other half wants something different. Mya – You have more people so you don’t get along as well. What is the best part about having a blended family? Tate-We can do big games like baseball football or soccer with only our family. Caleb – You get to do a bunch of stuff that other people couldn’t do. Like we can have a big complex game or big group activities that normally require a lot of people. Mya – You can make more money because when there aren’t as many people there aren’t as many messes (I’ve recently hired her to help with cleaning). How did you feel when your mom and dad told you that there was going to be a new baby in the family? How do you feel about the baby now? Mya – Glad she’s here. Is there anything you wish you could change about your life right now? How did you feel when your new parent adopted you? Caleb – It was pretty cool I mean I was something that I never thought would happen. Mabel – I was little so I guess good. Mya – It doesn’t exactly feel like anything. Do you ever think about the future with such a big family? What does that look like to you? Mabel – My children can meet my sisters and brothers children. Mya – I envision that we’ll all have our own families away somewhere. I’m not sure about Luke though. Caleb – There’s going to be tons of aunts and uncles and cousins. That’s a good thing. What’s been the most difficult aspect of having a new parent? Mabel – It’s kind of like, oh my dad died so now what and now you have a new dad. I was little so I don’t really remember. Caleb – There aren’t any difficulties. Has your relationship with your new brothers and sisters grown deeper with time? Mabel – All of them are real so I fight with all of them. Mya – I feel like a normal family now. Caleb – Besides knowing each other’s crushes and stuff …. NO. Has your relationship with the new parent grown deeper with time? Mabel – Good. My dad in Heaven spent more time with me because he didn’t have a garden. He (Ryan) just spends time in the garden. Caleb – Yes, over time. We just bonded together more through fun stuff. Mya – Yes, I think so. It’s just mom and dad.